Valtteri BOTTAS: Thank You. Yes, of course, at this point of the year it’s a very, very good point to know what you’re doing next year. When there’s a contract still to be had for the future. So, yeah, very happy of course, first of all. And really, it also makes me a proud team member again. I think for sure the team, they were evaluating all the options, as always, which is fair enough. I’m really proud also that the team wanted me and no-one else for the seat so, for sure it feels good. Really happy to continue. Q: Valtteri, we’re at the half-way point in the season. How do you assess how it’s gone so far? And do you feel you’ve stepped-up from last year? VB: I feel by the end of last year I started to improve quite a bit. I think I’ve been able to carry that performance from the end of last year into this year in general. Obviously where I am in the drivers standing, the amount of points I have, it’s not quite ideal but I know, and the team knows, my performance each weekend and we can see it’s been a step-up from last year. For sure, I just want to keep getting better and keep improving as usual. Q: Esteban, while we’re talking contracts, perhaps I could come to you and ask you about contracts. It’s a furious silly season this year, particularly in the midfield, what can you tell us about your future? Esteban OCON: Yeah, I mean of course you know when there are rumours it’s almost good. It means that people are watching you on track and are quite happy with what you are doing. So, it’s always a nice thing. On my side, I’m always focussed on the job I have to do, and I think yeah, if people talk about you there is always plenty of opportunities. So, we’ll see. I’m not worried. EO: When there will be something, you will be the first to know. Carlos SAINZ: Yeah – I thought that was coming after Esteban’s question. Yeah. Pretty much the same: nothing has been announced recently. Nothing has changed from my contractual situation together with Red Bull and Renault. Until those two parties don’t move and they don’t know what Ricciardo is doing etcetera, my situation still doesn't change. CS: My priority is to find a place that I’m comfortable with. I’ve already spoken about a two-year deal. First my priority is what Red Bull and Ricciardo are doing and then myself together with my management team will find the solution I'm sure. Q: Valtteri, coming back to you to talk about this weekend. Very few straights here, some engineers refer to it as ‘Monaco without the Walls’. Do you feel you’re coming into the weekend on the back foot as a team, as a result of that? VB: I think historically for Mercedes it’s not been the strongest race. It is a fact. And we know the tracks where you need the maximum downforce, normally Red Bull has been really strong and Ferrari for sure as well. I think coming to this weekend we can’t say we’re the favourites. We come to this weekend knowing that we can do pretty well if we can get everything right and that it’s going to be again a close battle between three teams – at least – for the win. We’ve been seeing some really crazy races this year and I think it’s going to be a close fight again. We’re not too confident, in a way, but at the same time if we do a good job, everything is possible. VB: It is. It’s a race where I think most of the Finns, they come to. It means a lot to see so many Finnish flags. Even the local fans here, there’s big support I feel. I think there’s a lot of fans of mine and I’m really happy to see all of them this weekend. Q: Coming back to you Esteban. You’re just one point behind your team-mate Sergio Pérez in the world championship now. Can you just talk to us about how this intra-team rivalry with him this year has changed since last year? Is it more intense? How do you feel? What’s the feeling in the team? EO: It’s always been big. The rivalry we have inside the team. I think it’s good. It pushes us up and pushes us to perform better, I would say. Of course, you know, I’m getting more experience. Towards last year I was happier with the job I was doing with the team, and also this year I feel strong. I feel very good at the moment – but it’s a close fight until the end with Sergio. Of course, we both want to finish ahead of the other one. But, you know, he’s pushing me hard, I’m pushing him hard and I like the rivalry we have inside the team. But the atmosphere is still great and we have a great relationship, so it’s all good. Q: Carlos, very close battle with team-mate Nico Hülkenberg this year. 7-4 in qualifying so far. Can we get your assessment at this halfway point of the year as to how you feel you’ve done at Renault, how you’ve settled in? CS: Yeah, I think I’ve settled in pretty nicely, especially, I would point out, since Baku, Barcelona, I’ve managed to what I wanted to do to get the car a bit more to my liking. A bit more towards my comfort. And just when I managed to do that I started to do good qualifyings. Looks like Sundays have gone a bit more complicated for me – not achieving, or not getting all the points I would like to get – but those kind of things have been a bit out of my control recently. I’m particularly happy now where I am with the car and the speed I have with the car. Q: (Scott Mitchell – Autosport) Carlos, to pick up on something you said there. The progress you’ve been making, or you feel you’ve made with the car this season, do you feel the complications, the problems you’ve had recently have maybe masked the extent of that progress that you’ve made; that breakthrough that you’ve made? CS: Yes. Definitely. I think if start picking up the points that I’ve lost in the last three or four races, for things that are a bit out of my control, I think my position will be reflected a lot better. My team knows that, I know that and in terms of speed, especially since, as I said before, Baku/Barcelona I’ve taken a step forward and I feel a lot more confident with the car. All those, as Valtteri said before, sometimes the points don’t reflect the situation and the realistic state of your championship and your performance. VB: Yeah. I’m definitely always really hungry for the wins and yeah, of course we always want to win, and yeah, the longer it goes from winning a race and knowing you’re in a car that each weekend there is an opportunity for that most likely. For sure it’s… yeah, I really want to win and for sure it would mean a lot – but yeah, it was not meant to be again. There was different things happening in the race. Obviously when Sebastian went off, at that point I was leading the race. Just in that situation, with the state of my tyres, with the rain, I kind of had no opportunity except to stop so I lost the lead. But yeah, that’s life. We’ve seen those kind of things happening as well earlier this season and I don’t think I’m the only one with those things happening either. VB: Yeah. We did have a good battle at the safety car restart. I think we raced really fair but we both obviously wanted to end-up ahead. Yeah. I think at some point we were completely side-by-side so for sure it was close. Q: (Dieter Rencken – Racing Lines, Racefans.net) Esteban, when you signed the original Force India contract, just before Brazil 2016, you said you were fairly involved in it and that there were five parties involved? I’m assuming you know your contract pretty well. Could you clarify for us whether Renault has any option on your services or can you only go to another Mercedes-Benz team? EO: I won’t go into details on that. I’m managed by Mercedes, this is not a secret, but I won’t go into details on my contract. Q: (Andrea Tajthi – Motorsport Mania) My question is for Valtteri. As I know you are quite a quick runner, what is your track record at the Hungaroring and are there any F1 drivers who can run faster than you? VB: I can’t remember my time here. Obviously I do love running and when I had more time, as a test driver, I used to run a lot more of the tracks. I have no idea of the lap time and no idea about other drivers and their running. Obviously we all need to be very fit and I’m sure everyone can run well, but I can’t remember, sorry. Q: (Peter Vamosi – Racing Line Hungary) A question to all the drivers. In 1971 there was a race in Brands Hatch called the Jack Brabham Trophy, which was a race for team principals. They had identical Ford Escorts, and by the way Jack Brabham won it. What do you think about an idea, today, something like that as a support race for Formula 1, for team principals and who do you think would win it? CS: I would like that kind of race for sure. And I would like it also for racing drivers, to put all racing drivers in the same car for one race a year – imagine Macau Formula 3 – put all of us in exactly the same car, exactly the same engine, just to check the drivers’ performance. The team principals also, that would be fun. Maybe we could join the two races and we could just have fun for a weekend in Macau or something like that. There you go, my idea! Let’s see if they do something. CS: Out of the team principals? Good question. Who has a racing past? I think Christian Horner has been a racing driver. Give me ideas? CS: Toto also. So those for sure have the best chance but then we would also have fun seeing other people. EO: Should we be engineers, though? That would be fun. EO: Engineers who tell them what to do. VB: It would be very good to watch. I think it would be nice to manage them actually, and properly be their bosses. CS: Their driver coach or something. VB: Make all the calls and positions and they would maybe get a feel of how we feel in the car. VB: Good questions. I think some of them can drive – at least Toto very much thinks so. No, he is alright, so I think he would be up there, thereabouts. EO: I agree with Valtteri. Q: (Adrian Rodriguez Huber – Agencia EFE) A question for Carlos. Obviously at this point of the year every year there are a bunch of rumours. One of them, I don’t know if it’s true, I read it, is maybe you joining Fernando next year in the same team. Does this make any sense to you and what do you think about this? CS: You’re going for the headline here right. No, I cannot comment on it. Nothing changes until I’m not… until my future is not decided by Red Bull or anything like that and Ricciardo doesn’t sign a deal etc my future is still uncertain and I’m not linked with any other team yet. CS: I don’t know, because I haven’t even though about it, as still it’s not happening. I’m ready to beat anyone in the field. My racing spirit and my competitiveness and my self-confidence tells me that I can take over anyone. Probably Fernando would be the biggest ask that you could have on the grid, that’s for sure, but yeah, I would feel ready for anything. VB: I do believe we are still allowed to race freely. Obviously it always goes case by case but there’s no plan in place at the moment for me being at all in a support role. We are still on equal terms. That’s the plan for now. Obviously hopefully it will continue until the end of the year. Back to what happened, you know, I think with all the difficult races we had on the triple header, we lost so many points with different causes, and I kind of get the team’s decision after lap one. We were side by side a couple of times and they wanted to get those points. I am very confident they would have done the same if I was in the lead at that point. Yeah, that’s how it is. 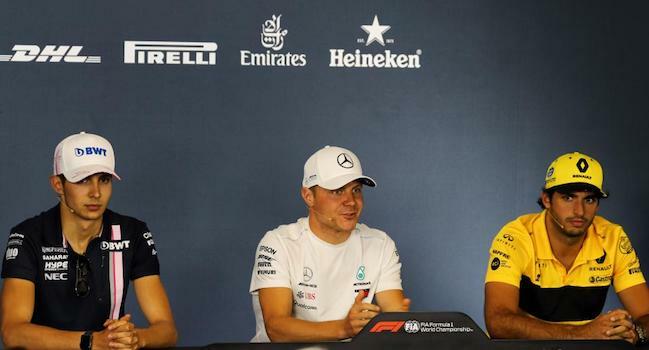 Q: (Dieter Rencken – Racing Lines, Racefans.net) Going back to this team principal race, and Valtteri, particular what you said, didn’t you have a race against Toto one day? Could you tell us about it please? EO: No? Are you sure? Q: (Dieter Rencken – Racing Lines, Racefans.net) And what happened? VB: Nothing really happened. Honest. I promise!